A super simple recipe that is perfect for those busy mornings. A can of hash, a few eggs, and some seasonings is all you need. Preheat oven to 400 degrees F. Spray 12 muffin cups well with cooking spray. Evenly press hash in each muffin cup. Bake for 15 minutes. 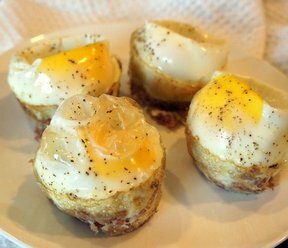 Crack an egg on top of hash in each muffin cup. Season with salt and pepper. Bake for 8-10 minutes, until eggs are cooked as desired.